Years ago, I first saw this beautiful painting on a book-cover. It was another ‘Wuthering Heights’. I’ve seen it on a number of paperback novel covers since. I’ve long been captivated by this image and after its first discovery, had to know who the lady was, and perhaps more particularly, who painted it. 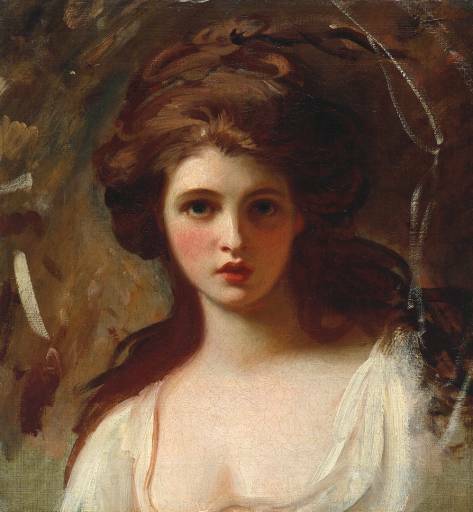 With more than a little help from one of my daughters, I finally found out that I had been drawn to one of English George Romney’s many renditions of ‘Lady Emma Hamilton’. Among other things, she was Lord Horatio Nelson’s mistress of many years, and they eventually had a daughter, Horatia. George Romney was mainly a portrait painter, ultimately working mostly in London. They say Emma was his artistic muse. He painted many other lovely works of her, but this is the one I always come back to. The style, the look, the magic. Haunting, in its lovely way. Neither painter or muse lived perfect nor perfectly happy lives, but this treasure was left to the rest of us because of the two of them.